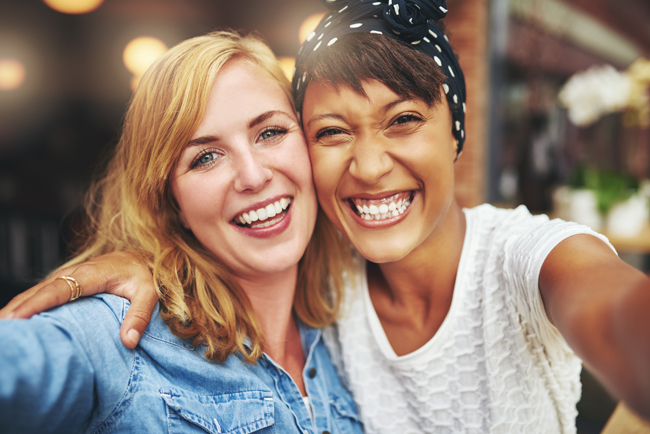 Here are some tips on developing strong, lasting friendships. In all relationships, bonding is everything, whether it is your mate, your child, your family, or your friend. The moment you meet someone on a date, the first thing the two of you do is share your history. That is the first step towards intimacy and bonding. By telling your story and listening to the story of others, you learn about shared experiences, challenges, and what you have in common. You discover who that person is under his/her skin; how they view and experience the world; their likes and dislikes; and, their interests and passions. This information connects you to one another and gives you a way to relate. Such intimate sharing is so powerful that it can become a vehicle to help you emotionally touch one another, and even help confirm each other’s feelings. Be respectful and value both yourself and others by recognizing that each one of us is a unique human being. When you give your full attention to another’s story and life experience, you gain insight not only into the other person, but into yourself. The message you give to the other person is that you appreciate and value what he has to say, who he is, including his passions. This exploration of self and others also gives you good information to help you to decide whether this person is the right friend/relationship for you. Do you share common values, goals and interests? Do you see the world through similar eyes? And most importantly, can you be your authentic self with him? Find your inner voice, your vocation, and dare to listen to it. Only the outcast can lead. By being yourself and respecting yourself you will find others like you. There is nothing worse in friendship or relationship than feeling that your friend is so high-maintenance that you can never be your essential self or have your needs met. Knowing that informs you, that you are not liked or valued for who you are, but rather how you perform. Recognize that each of us has our own special talents and gifts. By listening to that inner voice, you will find not only a good friend who likes you for yourself, but also, your place in the world. The unconscious is always organizing your outer world to bring you to that understanding to bring you to consciousness and your authentic self. By being who you are and who you were meant to be, the unconscious will bring you what you need to support your journey and that is always bigger and better than what you could imagine for yourself. This is how you access your own gifts and talents, and this is how you create a legacy. If you change the course of one person’s life for the better, in a sense, you change the world. The ripple effect of kindness is transformative. Finding friends with common interests, passions, and values can give you the support you need to recognize, acknowledge, and follow your inspiration to make your dreams reality. By offering value-for-value, you have the opportunity to create a true legacy. For example, when you help someone, you lend value and meaning to your life, and that validation allows you to give value to others. Don’t pressure anyone, including yourself. In relationships, people react to pressure by either shutting down or withdrawing from the source of their pain. Pressuring another to see or follow your point of view can frighten a friend away. The most common desire is the desire to be free, and when you force your perspective onto others, you threaten their sense of self. This feeling of “gotcha” is both demeaning and humiliating. Manipulation and bullying diminish who you are and defines what you think of your friend or mate. It is difficult enough to control yourself, never mind the actions and behavior of others. People who have the need to control are often feeling out of control. When you move into friendships with low self-esteem, you attract friends that have low self-esteem. This forfeits the opportunity to make a mutual and healthy relationship. The best friendships and relationships are crafted from a place of strength not weakness. Nobody likes needy friends. In fact, it is important to honor your friends’ need for space and distance…and that takes maturity. However, by bullying and manipulating others, you are revealing your own insecurities. Often in friendships and relationships, you gravitate to that which you need and are familiar with, rather than what you want. If you pay attention to your behavior, you can deliberately override it, and choose a more healthy approach. Don’t be a Critical Parent. Whether in relationship or friendship, grownups have passed through the stage in which they need or want to be judged and criticized by their parents. Unless you want all the negative baggage from parental relationships to enter and merge with your friends/relationships, you need to keep judgment away. When you criticize others with a charge and a passion, you are usually projecting out your flaws and vulnerabilities. Remember that the pointing finger points back. If you have a particularly intense reaction to another’s behavior, it is often because you see some aspect of that behavior in yourself. This is called projection. By recognizing, acknowledging and integrating back your projection, you have the opportunity to redeem it. This is the path towards wholeness and health for both you and your friends. Sarah Ockler, wrote in Fixing Delilah, “In your entire life, you can probably count your true friends on one hand.” It takes a lot of effort to be a real friend. It takes commitment, obligation, mutuality, and responsibility. As a result, that level of interaction cannot be shared with everyone. There are levels of friendships and the wise person understands the difference. You can give confidences to a friend, but you have to first know that they are a friend. They need to fit into the categories of commitment, obligation, responsibility, mutuality, and share your values. Friends should be loyal and validate you, be there when you need them, support your dreams and goals, be mutual and trustworthy. Authentic friends value your friendship and treat it gently. A true friend is someone you can count on to be in your corner, whether you are right or wrong. Remember my last point: weed your garden. Let go of the negative and toxic people in your life and make room for real friends, who like you for who you are, value you, and validate you. A good friend is hard to find, and a true friendship takes commitment…it is worth the effort.